Welcome back to the Pinterest Boot Camp series! If you missed the first post in this series you can check it out here: Is Pinterest Right for Your Business: 14 Niches Perfect for Pinterest. 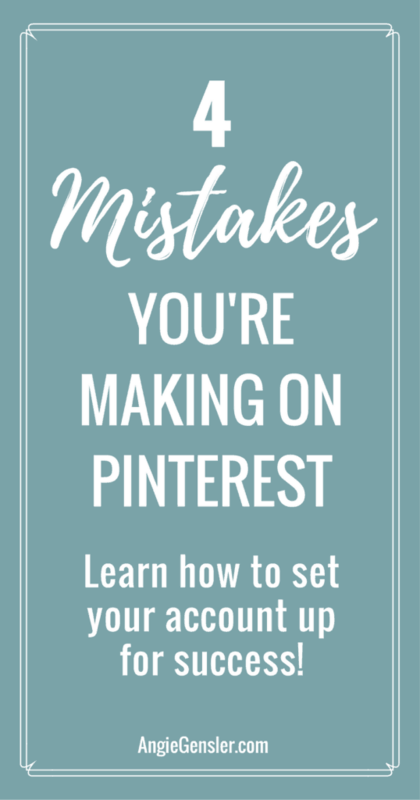 In this post, I’m going to share four common mistakes people make with their Pinterest account. But I won’t leave you hanging! 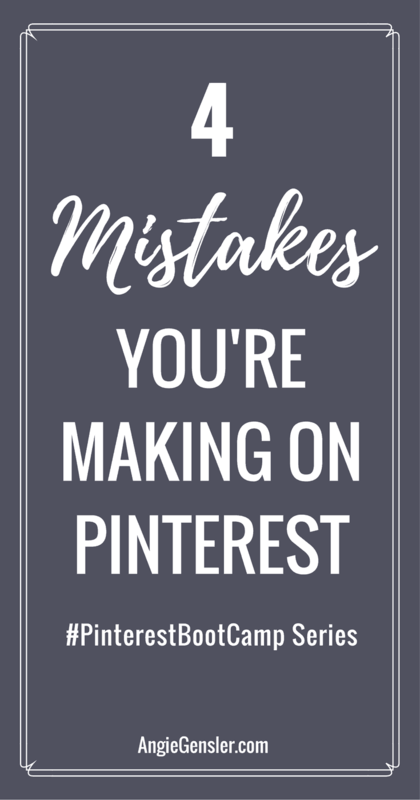 I’m also sharing how you can avoid these mistakes and set your Pinterest account up for success; generating traffic and leads for your business. Whether you already have an active Pinterest account, or you’re just getting started, this post will provide you with actionable tips and advice to create a brand new account or enhance your existing account. More often than not, when I hear a business owner claim that Pinterest doesn’t work for them, it’s because they never took the time to build a solid foundation and properly set their account up for success. Before I share the four mistakes many people make and how to set your account up for success, I want to first address the type of account you need. Pinterest offers personal accounts and business accounts. If you are using Pinterest for business purposes you NEED to have a business account. Besides being required to have a business account, there are actually four HUGE benefits to a business account: analytics, rich pins, promoted pins, and buyable pins. Did I just lose you? Check out this short video and I’ll explain each benefit in more detail. Ok, so now that you know the type of account you need, let’s talk strategy on how to set it up! The short answer to this question is YES, you can convert your personal account into a business account. However, depending on your business, this doesn’t always make sense. There are a lot of factors to consider when determining which option is best for you and your business. To help you make the best decision for your business, I’ve created a short video discussing the various factors to consider when creating your Pinterest Business account. If you need help creating or converting your account, check out this super simple, helpful guide from Pinterest. Now that you have your business account created, there are four key elements you must set up to ensure success. Many Pinterest users make the mistake of ignoring these four elements. Uploading your photo is by far the easiest task you’ll ever tackle on Pinterest, but that doesn’t mean you can just blow through this task. Your profile photo is extremely important and you need to be strategic! Your photo is included at the bottom of every single piece of content you Pin. It’s your opportunity to make a great first impression and brand yourself. If your photo is enticing enough you’ll attract new followers! Upload a photo of yourself, not your logo. Although this is for your business account, people want to follow people, not a faceless business. Upload a high resolution, square image (180 x 180 or larger). You do not want a blurry image! Use a free editing software such as Canva.com to create a square image and position your face exactly where you want it. Choose a photo that shows your personality or brand identity. See the examples below of some great profile photos! Now that we have the easy part out of the way, it’s time to get techy and confirm your website. Don’t worry, it’s a lot easier than you would think and provides a ton of benefits so do not ignore this step! Check out this super simple guide from Pinterest on how to confirm your website. Once your site is confirmed, your profile picture and account name will show at the bottom of any Pins people save from your website and you’ll also have access to your website analytics within the Pinterest analytics dashboard. Not a problem! You have options, although I’d still encourage you to work toward building your own website. You need a place your customers can find you that you own. In the meantime, you can link to your Etsy page, another social media account, or a landing page you created from an email client such as MailerLite. You won’t be able to confirm these links, but it’s not the end of the world. Bottom line, don’t leave the website field empty. You need a place to send people if they want to learn more about you or connect with you. Otherwise, what’s the point of a Pinterest business account? The biggest benefit of rich pins is automatic updating! More than likely, you’re going to update your website a lot and make changes. With rich pins, you don’t have to manually update all your pins as well. Another big benefit of rich pins is that more information is displayed on your pins which increases their visibility and enhances the user experience. Below is a comparison of two of my pins. The pin on the left is a rich pin. The pin on the right is not. Can you see the difference? For help getting your rich pins set up check out this handy guide from Pinterest. Did you know that Pinterest behaves more like a search engine than a social network? This is glorious for so many reasons, the biggest of which is that your content lives forever. 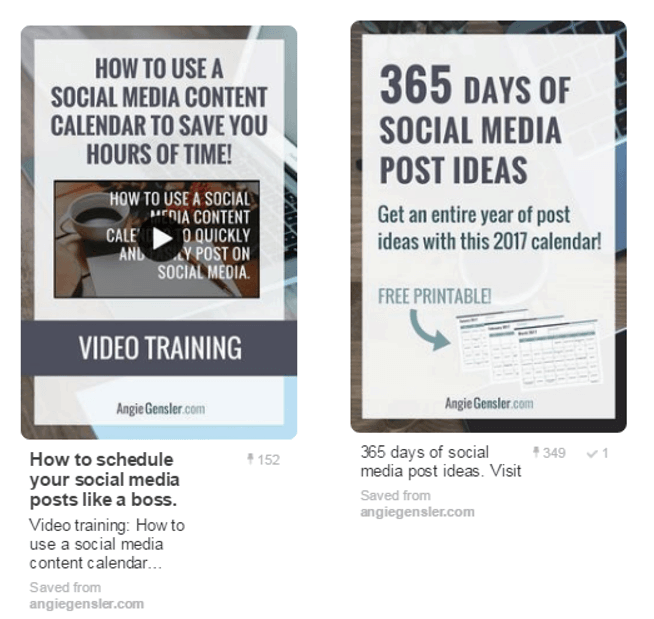 Unlike popular social networks, your content does not have a lifespan of a few hours. As long as you insert the right keywords, your content will continue to be discovered. So where do you put these glorious keywords? Essentially, everywhere! You want not only your pins to be found, but also your profile and your boards. I could go on for days about keywords, but I’ll save that fun for another day! The next post in the Pinterest Boot Camp series is all about optimization: 6 Ways to Optimize Your Pinterest Account for Maximum Results. I’ll teach you how to use keywords to optimize your profile and your content – allowing your target audience to find you! If you don’t already have a business account, set one up now! Keep reading >> Check out the next post in this series: 6 Ways to Optimize Your Pinterest Account for Maximum Results.